Do you like tacos? Do you make them at home? If so, you’ve probably bought one of those kits made by Taco Bell, Ortega, or Old El Paso. Or maybe you just buy the packet of seasoning packages and add that to the beef or turkey. I am guilty of this. I buy the taco seasoning mixes all the time. I hate to break this to you, but if you do too, we are wasting money on seasoning mixes. Those seasoning packets are wildly overpriced and not that good for you seeing as they add all sorts of things to preserve seasoning for as long as possible. In this post, I will show why you are wasting money on seasoning mixes and how to save money instead by making your own. At my last visit to the grocery store, I looked at prices for these mixes, and those packets cost $1.19. If you want to try to save some money, you can buy the store brand for around $1. Of course you could steal the seasoning mix but that would be illegal. To prepare the ingredients in the packet costs the manufacturer about $0.10. The other dollar goes towards packaging, marketing, and profit. Look at it this way, 90% of your payment is convenience fee. Would you pay a 90% convenience fee for your mortgage? How about a 90% convenience fee for cashing a check? So why should you pay it for tacos and other meals you want to season? The same idea holds true in the produce section. A pineapple will run you about $2. But if you buy the pack of fresh pineapple that has been cut, you are looking at over $4 for a quarter of a pineapple. You pay more for convenience all the time. Moving back to the seasoning mixes, if you look at the ingredients list on those packets, they contain a mix of spices plus whey, starch, and ascorbic acid. In theory, the starch would be a thickening agent, but it’s completely unnecessary. The spices thicken just fine without it. In reality, it’s just low cost filler. The ascorbic acid is a preservative, and is rendered unneeded if you make it fresh. And then there is the whey. Well, I have no clue why whey is included, but it means that anyone with a lactose intolerance or dairy allergy can’t have it. That’s just the list for one of the healthier ones. Others include MSG, food coloring, and cellulose. Cellulose in an indigestible tree fiber that is used in foods as a bulking agent. This means it is used to make it seem like there is more food then there really is. 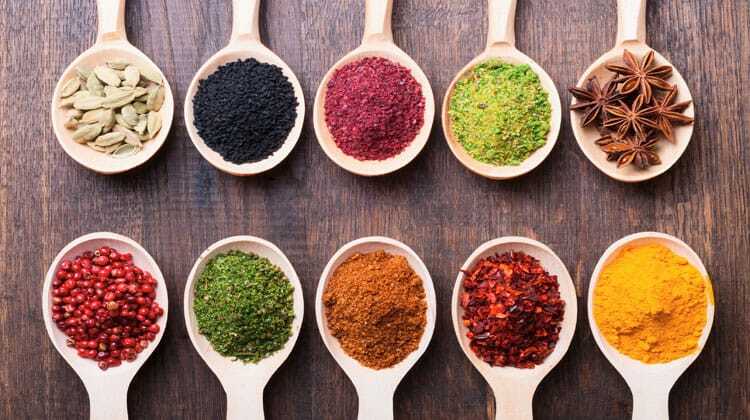 You probably don’t buy your seasonings and spices in the same quantities as Ortega or McCormick, which if you did, you could save money by purchasing everything in bulk. But you can still make your own taco and other seasoning mixes for under $0.35. Below are some recipes to easily make your own seasoning mixes. Here is a simple and spicy taco seasoning that will make your dinners come to life. This recipe is equal to one package of seasoning mix that you buy in the store. If you find that it is a little too spicy for your taste, you can omit the red pepper flakes. Make sure that you are putting the seasoning into an air tight container so that it stays fresh. Mix ingredients together in air tight container by shaking for 15 seconds. On a cold day, who doesn’t love a bowl of some zesty chili? This seasoning mix works great in beef, turkey and bean chili too! As with the taco seasoning, be sure to store this in an air tight container. If you are from the south, you can’t get enough of Cajun cooking. Here is a recipe for some great Cajun seasoning. While I don’t make Jambalaya, I will tell you what I love to put this Cajun seasoning on. My french fries and tater tots. It gives them a nice kick. Be sure to store this mix in an airtight container. I don’t like ranch dressing or seasoning. But my wife does. And every time I go grocery shopping, I am buying a packet of ranch dip seasoning mix. Luckily, there is another option to make ranch seasoning and save money. You can store this mix in an airtight container. Mix dry ingredients together in air tight container by shaking for 15 seconds. When you are ready to use the mix, simply mix it with plain greek yogurt and milk. When I was in college my one buddy loved to grill. When we could afford a treat, we would buy some steaks and he would grill them to perfection. They always tasted so good. I wasn’t sure if it was the way he cooked them or because I was a poor college student and when I actually had good food it tasted the best. In any case, I learned from him to use some seasoning salt on my steaks to really bring out the flavor. So here is a recipe to make your own seasoning salt. You should store this seasoning in an airtight container. One tweak to this recipe is to omit the salt to make it a salt free seasoning for those that are looking to limit their salt intake. If you like hot and spicy, you can’t go wrong with a jerk seasoning mix. Of course, if you would rather have it mild as opposed to spicy hot, cut back on the red pepper flakes. When you are ready to make it, add 2 tablespoons of canola oil to the mix. If you love ribs, and who doesn’t, this dry rub seasoning will make your ribs pop and will save you money at the same time! As with all of the other recipes listed here, you should store this in an airtight container. I list a lot of spices here. And if you have ever shopped for spices, you know they can be expensive. Over the years, I’ve found two places to go to save money on spices. The first is Costco. You can get a large container of spices and make a good amount of different seasonings. But if you aren’t planning to make a ton of mixes, this can be a waste of money. A better option? Amazon. Yeah, the online retailer that has everything has spices too. And the prices are a lot cheaper than grocery stores. For example, I can get chili powder for $2 for 2½ ounces! That is a steal. Just one word of caution. Keep an eye on the price per ounce. In the grocery store it is usually cheaper to buy the larger container. But for spices, it sometimes is more expensive. Looking back at the chili powder, they also have a 9¼ ounce container. It is $9.50. This makes it $1 per ounce where the smaller one is only $0.80 an ounce. As for airtight containers, might as well stick with Amazon since you are already there. I like these the best but there are many options so be sure to look around.
. This means you can sign up, buy your spices and containers, get free 2-day shipping and. And if you really don’t want Prime, then sign up for free, get your spices and then cancel. You save on shipping and it costs you nothing to try. Cooking from scratch can be intimidating, but seasoning mixes are a great place to start because they are so hard to get wrong. Yes you will pay more upfront for all of the seasonings you are buying, but remember, you are going to be able to make a ton of mixes. So over the long run you will be saving yourself a good amount of money. Plus your waistline will thank you too since you won’t be eating all of the extra fillers that the seasoning packets add in. And if you are still on the fence, here is my experience with this. We love making tacos and for a while were buying the packets. We really liked the kick of heat that one had. So when we decided to make our own seasoning mixes, I was skeptical that it would be as good. Heck, I was skeptical to the point that I was expecting it to be so bad we would need to order a pizza. To my surprise, it was just as good. There was a little tweaking we had to do to get the level of heat right, but it was a 99% match. The only thing that I did notice was that the homemade version of seasoning mixes didn’t coat the meat like the packaged ones did. I guess that is what some of those fillers are for. In fact, after I sprinkled the seasoning mix on and didn’t see what I usually see, I thought I needed to add more. But a quick taste test confirmed that the seasoning was there, it just wasn’t as visually apparent as with the store bought ones. I so agree – where is the “cheerleader smiley?” WE are playing with home made cuury paste at the moment – so far we have made Korma and Bhuna curries that out perform anything in a mix or a jar. Just soooo tasty – and NOTHING artificial, just cook up a batch and freeze the paste till you need it. Whole batch (20 portions worth) cost less than one jar of sauce – no multiply that by your family’s favourite meals over a year or so and there are substantial savings to be made. Great point as to why most people buy the packet as opposed to making it themself: intimidation. The same applies to managing your money. When you are intimidated, you will simply keep your money in a savings account and not earning a higher return. Take some time to educate yourself on the topic and you will benefit enormously. Good points here, Ed…..and if you don’t want to store all the different ingredients needed, you can buy them fresh from bulk stores as you need them. Once mixed, they last a long time and you don’t need to wonder if you remembered to pick up the packet. Another good thing to doing it yourself is that you don’t get all the added salt! It’s amazing how much sodium is in those packages! That really depends on where you live, spices are incredibly high in my area, family many times have been giving me spices as a gift due to the outrageous rip off prices in my area. A tiny tiny bottle of chili powser is over $4 where I live , curry tiny bottle for $5! Seriously ridiculous prices yet I found a huge bottle of taco seasoning on sale for $3 so for me although not healthy, definatly cheaper than buying the individual spices to mix my own! Sigh, really need to get a herb garden put in! Couldn’t agree more with this. I think all pre-prepared spice mixes aren’t just overpriced, but also inferior in terms of taste to ones you can make yourself. For the cheapest spices I go to ethnic stores. I can pick up big packs of cumin, paprika, coriander etc for less than £1, whereas titchy jars of the same stuff costs around £1.50 in supermarkets. Or check out buying spices online – there are about 3-4 fantastic websites here in the UK that you can buy spices at wholesale rate. Poor to Rich – I can feel a “Red Cross Spice Parcel” coming on as those prices are outrageous my love. LOL Elaine! Yeah I have thought about shopping onlne for them, I just never seem to think of it when I am shopping online! Great ideas – thank you for sharing! I hadn’t ever considered how seasoning mixes were wasting money – but now I realize how much I could be saving… thanks! Indeed, mixing the spices yourself is cheaper and tastier and more fun. To buy spices from ethnic stores becomes easier if you know some foreign names. I find this list most helpful to get spice names translated into Hindi, tamil, indonesion, Spanish. A whole new shopping opportunity opens up for you.